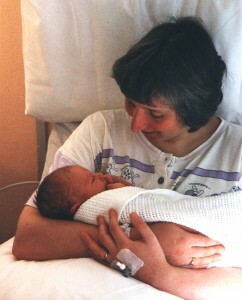 Sue experienced PP after the birth of her son Alex in 2000. On the occasion of their 50th birthdays in 2016, Sue and husband Iain asked friends and family to donate to APP, instead of giving them gifts. They raised an incredible sum, over £700! We are so grateful to Sue and Iain and their generous donors. When we got in touch to thank them, Sue sent us a copy of her book, “Method in my Madness” – the title of which came to her during her episode of PP 16 years ago. Here we share three of her wonderful poems. Sue reflects, “In the year 2000, my world was turned upside-down. I had Postpartum Psychosis, a severe episode of mental illness which begins suddenly in the days following childbirth. During my mania, I was mad about poetry and I promised to write a book called “Method in my Madness”. Clearly, such an idea was ridiculous, because at the time, I could not focus to write a single coherent sentence! It took me about 7 years before I could face writing a poem as it brought back such painful memories. abandoned; the baby didn’t come on cue. I wish; should the details be taboo? Surgeon poised with his knife. Is this the best day of my life? I can feel poking and prodding. head stuck, pushing and pulling. Implements and gowns all sterile. my hand; overwhelmed, is it joy? Huge relief: a baby boy! One week later, I was in the Royal Edinburgh Hospital. Mental health provisions for mother and baby were inadequate and I was separated from my new baby. Just a new mum: all nervous and tense. cut off from baby, no self–confidence. at doctors who irritate and annoy. and no idea how to change a nappy! painkillers make me dazed and numb. Is this a nervous breakdown? all day in my dressing gown. I’m just a new mum – all slowed down. Expressing milk but can’t feed. scared of what will be my fate? he is stressed and tense. his glistening eyes oozing sadness. It will be full of common sense. Good title: Method in my Madness! “Do you like it?” I burble. If only I could write a single sentence. There must be some method in my madness. my glistening eyes oozing sadness. Some day you’ll find method in my madness!